Why should I integrate technology? Quizlet allows students to study vocabulary words, create and share flashcards, and participate in interactive learning modes. Students have the option of working and studying independently or with a group. Additionally, students have access to a discussion box which allows him/her to chat with fellow classmates and group members. Learn Mode-provides a word and you have to type in a corresponding term or definition. If you haven’t heard about neoK12, this is the time to check out this cool site. NeoK12 catalogs the best free online educational videos from the Internet into one site. Each video is reviewed for content accuracy, tagged for age appropriateness, and cataloged into relevant categories and topics. 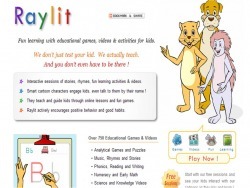 This site is 100% kid safe and have been viewed by K12 teachers. NeoK12 is a great tool for any grade and classroom. There are hundreds of videos related to science, social studies, math, English, arts, music and sports. NeoK12 has over 2400 education videos that span over 130 different topics. Teachers can create and share their own dashboard and bookmark their favorite videos and playlists. NeoK12 is a site worth checking out! Did I mention this site is totally free? Raylit offers a limited amount of free sessions. If you want to join, each session will cost $.50 each. Yaca Paca is a free e-learning platform created for teachers to use as an assessment tool. The two main functions are to create quizzes/tests and ePortfolios. Yaca Paca can be used for reading comprehension, self evaluation, assessment, improve writing and so much more. Mashface is a fun way to take images and mash it up a bit. It is a cool tool and is easy to use. All you do is choose a photo, record your mouth, eyes, etc., mash it and share. Teachers and students can use this to record famous quotes, poems, stories, and so much more. One warning...the site contains some scary images that may not be suitable for young children. Check out a Mash Face example below. Using timelines as a teaching and learning tool has been a part of classrooms for many years. It is a terrific way to connect history and time. Students can research topics/events, find images, collaborate, share and publish timelines on a classroom blog, wiki, or web page. There are a variety of different timeline makers on the Internet to fit any classroom need. One of my favorite (and free) Web 2.0 tools is Capzles. Capzles is a way to tell a story or an event using videos, images, mp3s, and blogs with a flash interface. Students can add a personal touch by selecting backgrounds, colors, themes, and music. It is easy to use and can be integrated in all subject and grade levels. Students can use timelines to tell a story, discuss major events in history, use as a presentation tool and much more. Take a look at Capzles. There are a variety of great examples and ideas. This Obama Capzle is one that really plays on Capzles different tools. 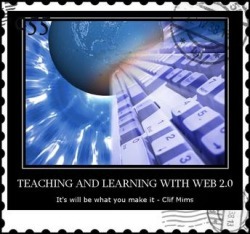 For additional information about timelines, check out our class Teaching and Learning with Web 2.0 e-book. View more presentations from glogster. Pixton offers a virtual classroom where students can create and share digital comics. This tool is easy to use and can cover a wide ranges of content areas, learning styles, and grade levels. Teachers can try out Pixton free for 14 days (enough time to do a small group or individual project). The virtual classroom enable teachers and students to go into their private virtual classroom to create and interact in a safe and secure environment. Teachers can tailor their room to student needs and create an unlimited number of comics. If you need lesson plan ideas, don't fret...Pixton has a lesson plan bank to fit all your needs. Pixton's easy-to-use comic editor consists of clicking and dragging content and images into a 3-panel or an epic comic up to 12 rows long. This tool even allows you to move your comic character into any pose and facial expression and remix the comics you already created. Comics can be created to make visual essays, storyboards, and characters. It is also a great way to reinterpret stories and historical events. Pixton comics can be printed or embedded in blogs, wikis, websites, and e-portfolios. Tuxpi is a great photo tool that allows students and teachers to apply photo effects. Want to promote visual literacy in your classroom? Here is an easy and free way to start! With Tuxpi, you can create motivational posters, postage stamps, wanted posters, pop art, speech bubbles and many fun effects. Students have the opportunity to communicate an idea about the subject they are studying. Anyone can use Tuxpi to celebrate a historical event, visually define a concept/topic, identify a famous scientist, or identify a significant place or theme. Tuxpi is very easy to use and can be incorporated in the K-12 classroom. All you do is select the effect you want to use, upload your image, and you are ready to save. This 1-click tool is worth checking out!